A new research has pinpointed a nursery of young stars some 2.4 billion light years away as the cause of strange fast radio bursts detected on Earth. 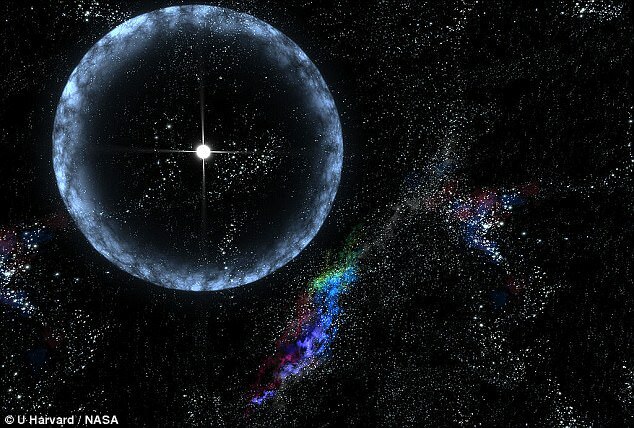 These fast radio bursts - which each lived just a few milliseconds - come from thick neutron stars just 20 kilometers (12 miles) in size in the constellation Auriga. Originally researchers were puzzled where these bizarre bursts of energy were originating from with some guessing it could be a sign of alien life trying to make contact. Scientists now consider the young stars are 6,200 light years from the center of the small galaxy called FRB 121102. Scientists from the Netherlands Institute for Radio Astronomy in Dwingeloo have used the Hubble Space Telescope to sobserve the small galaxy in detail never seen before. Astronomers consider the nursery of stars lies on the brink of the galaxy, which has a diameter of around 20,000 light years. The massive nursery is itself 4,400 light years across, astronomers believe. They think these FRBs are triggered by flares from the dense core of a young neutron star left behind when the mother star explodes. The previous 11 FRB’s are also believed to be coming from the same location in the small FRB 121102 galaxy. Some researchers still believe that this repetitions could be something else probably aliens or something way beyond our understanding. If there are any intelligent alien life forms out there, Stephen Hawking thinks we're playing a dangerous game by trying to contact them.